This is a post that is a little overdue. I meant to post it in October when green tomatoes are on the vine and the first frost is rapidly approaching but…stuff happens. 😮 Rather than wait until next October when the timing would be more appropriate, I decided to post it now. Better late than never, eh? I know some of you are wondering “What is Chow-Chow?” Until a few years ago I had never heard of Chow-Chow. I had heard of green tomato relish and had eaten my fair share. I just had never heard of Chow-Chow. Then came the Fall a few years back. Now, if you’ve been reading this blog for any length of time, you know I have a small raised bed garden that I like to putter around in. When we put it in, Baby Lady & I decided we would grow tomatoes. So, off we went to get a variety of seeds and plants. I forget how many different varieties of seeds and plants we purchased but we had 6 tomato plants in the little garden and several others in various pots around the patio. The plants grew beautifully, very hardy, lush and green, full of little yellow flowers. The only problem was that none of the little flowers would ever bear fruit. It was incredibly frustrating. Other friends I had were having bumper crops of tomatoes. We got none, zip, zero, nada one. Puzzled and slightly annoyed, I began reading about tomatoes. That’s when I found out that it’s too darn hot in Texas to grow most tomatoes. Don’t even bother thinking about growing heirloom tomatoes in the DFW area. By the time the plants are mature enough to bloom and bear fruit, it’s already hitting 90 F. Once the heat starts registering 90 F, the plant’s defensive system kicks in. Thinking it is too hot and water will be scarce, even when it’s not, the plant thinks it’s going to dry up and die. In order for the plant to survive and conserve precious water, it simply will not produce fruit. It gets what’s called blossom drop. Beautiful little yellow flowers that look pretty, then the flower stem begins to turn yellow, the flower begins to wilt and ultimately fall off bearing no fruit. The plant, however, looks really good and is very healthy. That was our summer of tomatoes or lack thereof would be more appropriate. I was so jealous and full of tomato envy. Then, as fate would have it, the temperatures cooled. Once the temperatures cooled, the tomato plants knew it was time to reproduce. All of the sudden, little yellow flowers turned into small green globes that grew and grew. 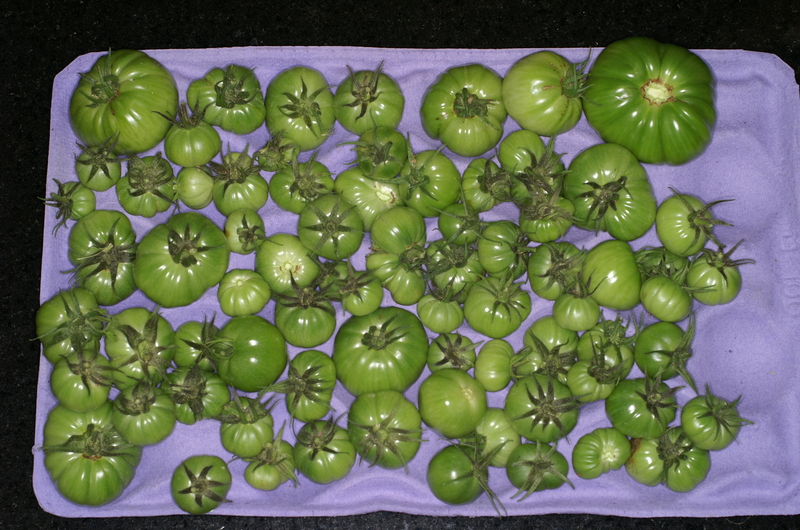 Sadly, only a few ever turned red but I had a plethora of green tomatoes. What do you do with loads of green tomatoes? You can only eat so many fried green tomatoes, which are delicious, by-the-way. I pickled the small ones as you would do cucumbers. This were pretty darn tasty, too. But what was I going to do with the larger green tomatoes? 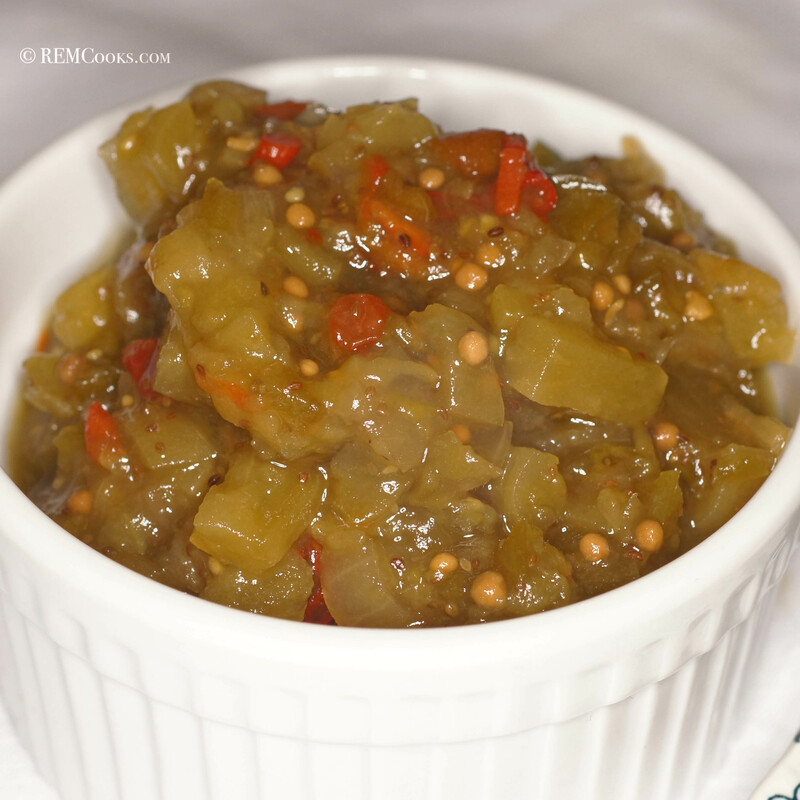 This is when I got on the trusty world wide web confident that I would find some recipe for a green tomato relish. That is when I discovered Chow-Chow. You see, Chow-Chow is a green tomato relish. It’s a traditional southern relish that dates back as early as 1770 and is made with a wide variety of garden goodies, i.e. green tomatoes (and sometimes red tomatoes), cabbage, mustard seed or powder, onions, hot peppers, sweet peppers, cucumbers, celery or celery seed, carrots, beans, asparagus, corn or cauliflower. Some people even use tumeric or curry powder. Most Chow-Chow recipes call for green tomatoes, cabbage, sugar, and vinegar. My recipe omits the cabbage. The taste can be sweet, tangy, hot or a combination thereof and it is typically served cold. 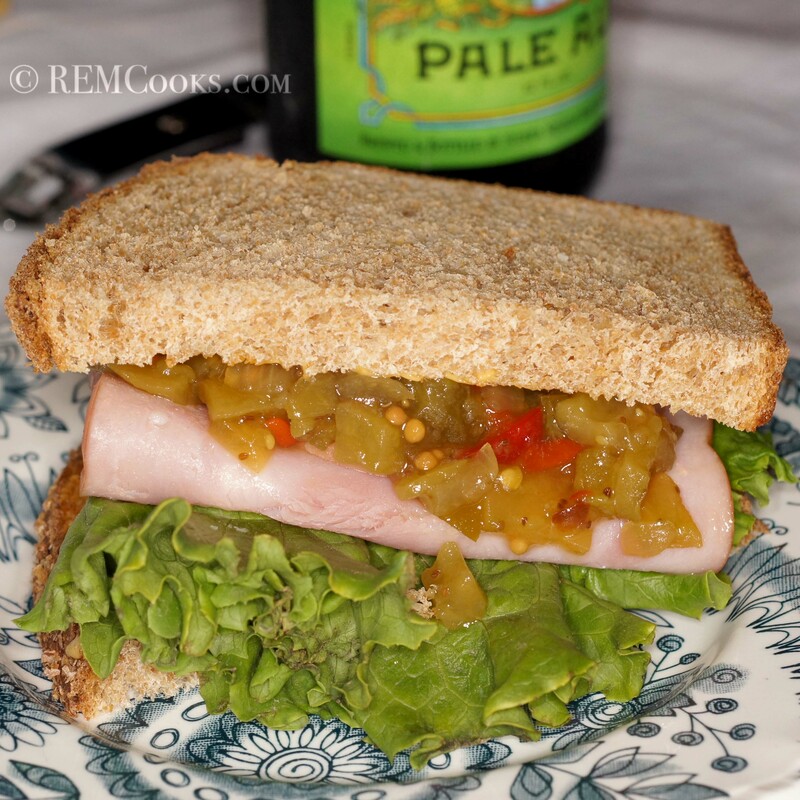 It’s a wonderful relish that goes with almost anything. 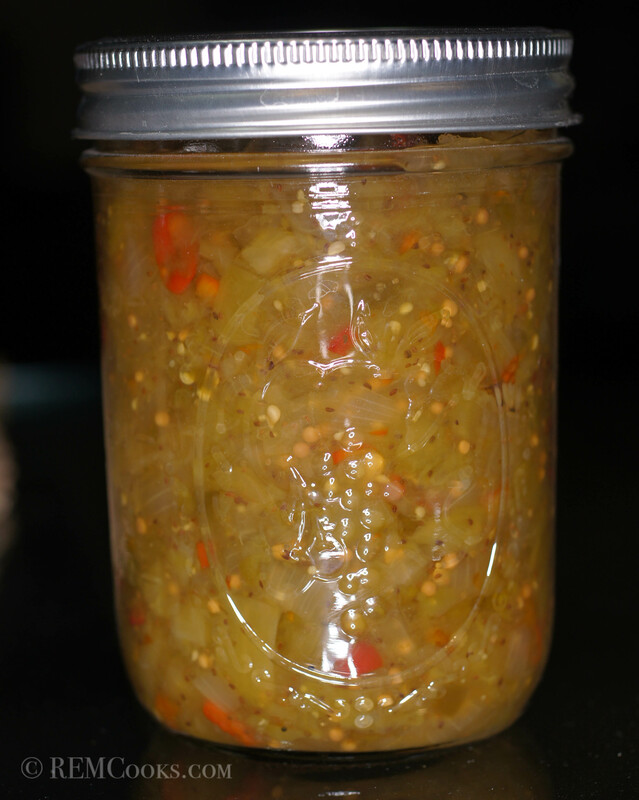 It’s good used as a multipurpose relish on hotdogs, hamburgers, sandwiches and with sausage. You can also use it to jazz up veggies, like cauliflower and green beans. Some people (not me) even put it in pinto beans or with (gasp!) chili (heaven forbid!). Michael Symon has a recipe for pork chops with Chow-Chow. It’s that versatile. There are an infinite variety of Chow-Chow recipes out there. This is mine. We hope you like it. Core and chop the tomatoes and peppers either by hand or in small batches in a food processor. If you prefer a chunkier style relish dice by hand. Put the chopped vegetables in a large non reactive pot. Add the mustard seed, celery seed, vinegar, kosher salt and sugar. Stir well and bring to a simmer over medium heat. Cook stirring often and skimming as needed. Simmer until the relish/chow chow cooks down and thickens into a relish, about 2 hours. Turn into hot sterilized jars and process in a hot water bath for 20 minutes. Viola, Chow-Chow! I always wondered why there were bluebells in your background photo! Now I know! Yep, I’m just a Texas boy. 😉 They sure are beautiful in the Spring. Your Chow-Chow looks delicious! I don’t have any better luck growing tomatoes that you, Richard. Purple thumb here. My Dad who lived in Texarkana grew tomatoes and vegetables enough to fill his 2 freezers, mine and half of Texarkana’s in his 1-acre garden. But alas, I didn’t inherit his green thumb. Hi, Peggy. Thanks for the nice compliment. 🙂 We actually can grow a lot of things in the garden, just not tomatoes. It just kills me because fresh tomatoes off the vine are one of my favorite things. Hi John. Your ketchup is on my list of things to try when tomatoes come back in season. Too bad I can’t use my own but will have to go to a farmers market to get some vine fresh ones. 😦 This chow-chow is really nice with a lot of depth of flavor. We really like it. I’ve heard of chow chow but have never had it. A great way to use some of your green tomatoes. Hi, Karen. Chow-Chow is a sweet and tangy relish. If you have any green tomatoes at the end of the season next year, you should give this a try. Hi, Allison. Thanks for the nice compliment. 🙂 This is pretty tasty stuff and given all I really got for my gardening troubles was green tomatoes, I had to find a way to use them. 😉 One of these days I want to try Michael Symon’s pork with Chow-Chow. It seems intriguing and how can you go wrong with pork? Sounds delish. Looking forward to that! This really looks delicious. Wonderful picture…I am drooling already! I am going to try this for sure. Thanks for dropping by and commenting. We hope to see you around. Chow chow pickles seem like the most appropriate thing to chow down on. I love that bounty of green tomatoes you have there and really wish my garden was even an ounce as fruitful os your gorgeous tomates there. Green tomatoes aren’t really the rage here, but I have fond memories of “fried green tomatoes at the whistle stop cafe” of course (incidentally) that’s the first time I heard of them. Either way it all looks very tasty Richard! Thanks! I, cooked greens tonight and found a few green tomatoes at the fruit and vegetable market today. Just wondering–4 bell peppers and 4 onions seems like a lot for just 12 tomatoes–even large ones. Do you have “cups” measurement for this? I want to try to make it but don’t want to mess up by using enuf tomatoes. Sorry but I don’t have cup measurements. It’s not a pure tomato relish and the measurements on the fruit don’t have to be exact. We thought 5 bell peppers and 4 medium onions (2 large onions) were fine. Thanks. I’ll use your recipe as a base and “tweek” it. Could tomatillo be used in place of tomatoes? Can’t wait to try this. How many quarts or pints will this recipe make? Thanks Judy, I believe you will end up with four pint jars.